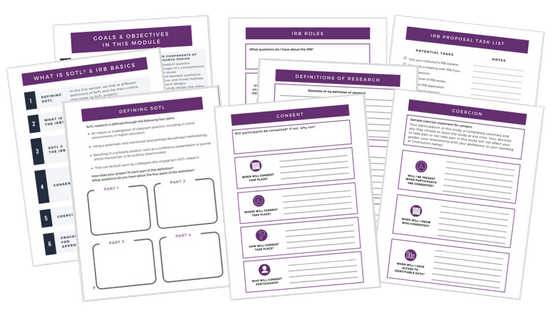 Each course license includes a printed 100+ page workbook for completing course activities and making notes about SoTL project design and implementation. 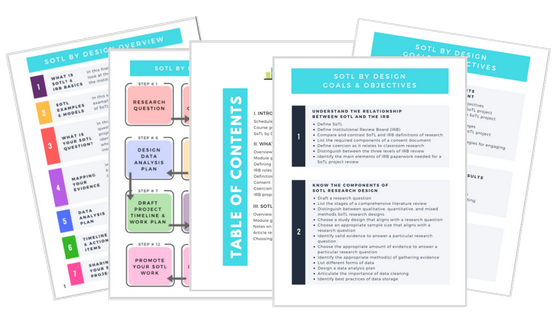 Each workbook starts with an overview of the SoTL by Design course goals and learning objectives, a pathway diagram for navigating any SoTL project, and a detailed table of contents. 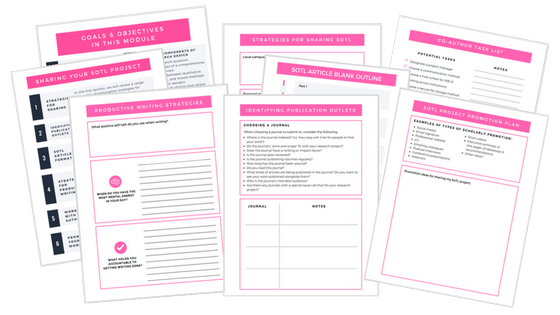 Individual parts within the workbook also begin with a section overview and a review of which goals and objectives are covered in that section. The first section of the workbook is focused on looking at the relationship between SoTL and the Institutional Review Board. Worksheets include activities for defining SoTL, learning about the roles of the IRB, defining research, designing a plan for consent, putting steps in place to mitigate coercion, and creating an IRB proposal task list. The second section of the workbook is focused on exploring different examples of SoTL and the various categories of SoTL research designs. 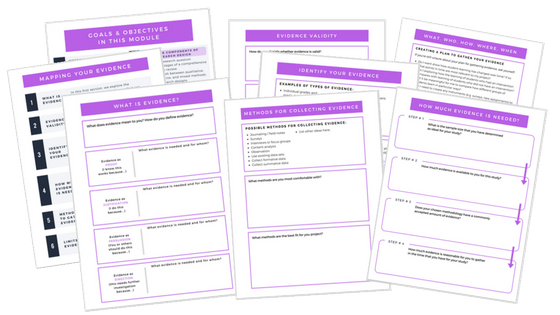 Worksheets include activities for writing down initial questions about research design, taking notes on examples of five categories of research designs reviewed in the course videos, and choosing a project sample size. Part 3: What is Your SoTL Question? The third section of the workbook is focused on identifying the question, problem, or issue that the SoTL project will address or respond to. 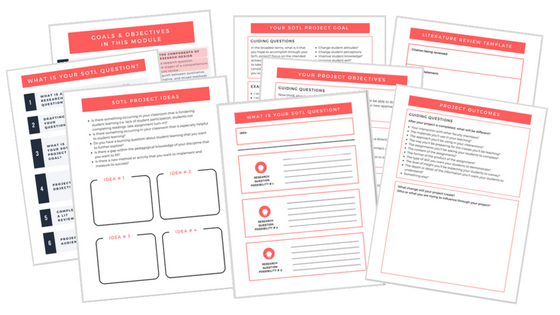 Worksheets include activities for brainstorming SoTL project ideas, drafting potential research questions, exploring project goals and objectives, and identifying the project audience(s). The fourth section of the workbook is focused on mapping the evidence collection plan for a SoTL project. 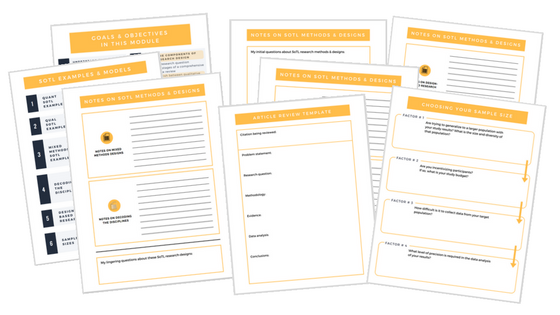 Worksheets include activities for identifying appropriate evidence, determining evidence validity, deciding how much evidence is needed, choosing methods for collecting evidence, creating a plan and timeline for evidence collection, and ensuring that the evidence collection plan aligns with the project’s research questions. The fifth section of the workbook is focused on creating a data analysis plan that aligns with the project’s research question, evidence, and audience. 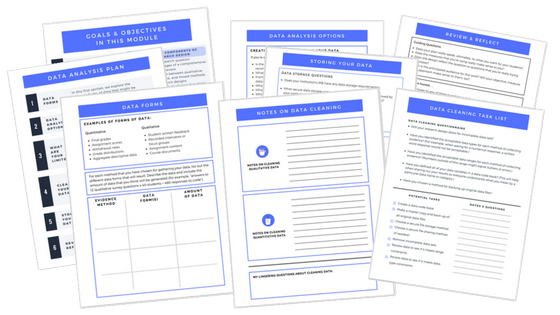 Worksheets include activities for identifying forms of data, reviewing data analysis options, articulating data cleaning tasks, reviewing options for data storage, and a final activity to offer space for reviewing and reflecting on the project at this stage in design. The sixth section of the workbook is focused on drafting a timeline and work plan for effectively completing a SoTL project. 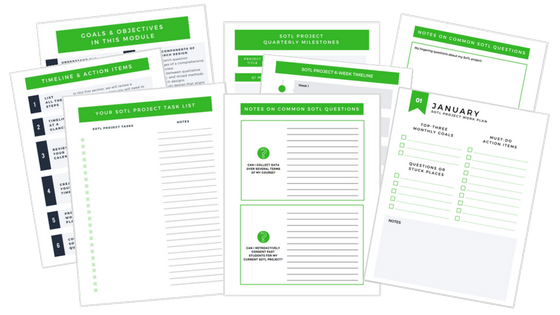 Worksheets include activities for drafting quarterly milestones, creating a comprehensive SoTL project task list, creating weekly and monthly work plans, and for taking notes on the answers to some common SoTL project questions covered in the course videos. The seventh and final section of the workbook is focused on sharing and disseminating the results of a SoTL project. Worksheets include activities for identifying appropriate strategies for sharing SoTL results, targeting particular journal outlets, outlining a SoTL article, being a productive writer, working effectively with co-authors, and creating a promotion plan for sharing about SoTL work. Want monthly SoTL by Design updates? that are made to the course including additional modules, bonus content, and other handy resources.